FOR THE PEPPER SAUCE: process peppers, onion, oil, and sugar together in food processor until smooth. Season with salt and set aside. FOR THE STEW: heat oil in Dutch oven over medium high heat until shimmering. Add half of tomatoes, half of onions, and half of cilantro and cook until vegetables are softened, 5 to 7 minutes. Pat fish dry with paper towels and season with salt and pepper. Place fish on top of softened vegetables and sprinkle remaining tomatoes and onions over top. Add clam juice and bring to gentle simmer. Cover and simmer gently, stirring gently a few times, until fish is almost cooked through, about 4 minutes. 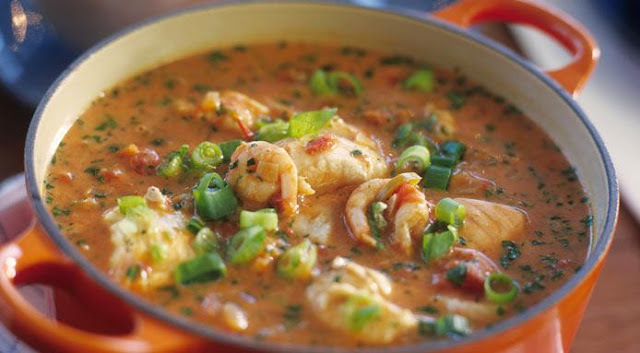 Add coconut milk and continue to simmer gently until fish is just cooked through, 1 to 2 minutes longer. Sprinkle with remaining cilantro and season with salt and pepper to taste. Serve, passing pepper sauce separately. End.